It's good to see a man proud of the place in which he lives. It's good to see a man live so that his place will be proud of him. 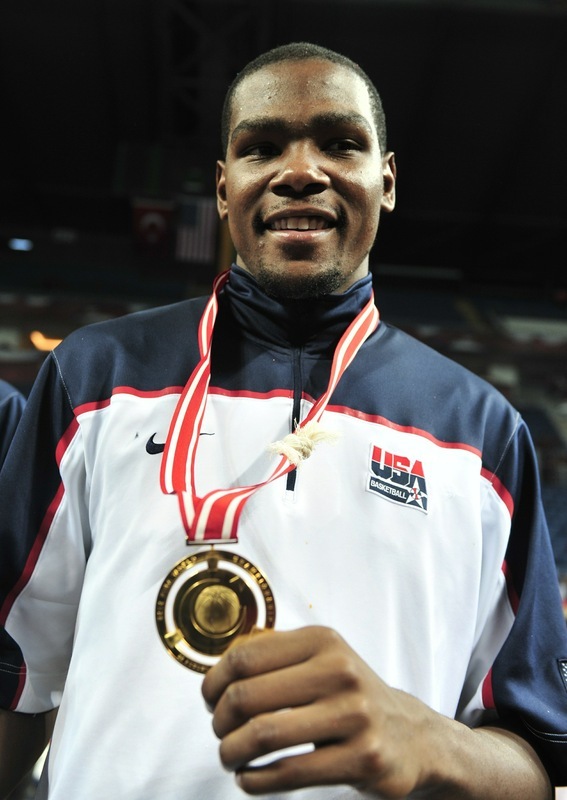 It all started several months ago when Kevin Durant led team USA to win golden medals in the 2010 FIBA World Championships. Humble Durant had a dynamic performance and set numerous records for the U.S. team. During the World Championships, Durant had an average of 22.8 points, 6.1 rebounds, 3.1 assists and 1.4 steals per game which were a strong catalyst to an impeccable victory in Turkey. And to think that all of this was done without the help of LeBron James, Kobe Bryant or Dwight Howard. KD is definitely enjoying more than 15 minutes of fame. He is doing a great job at leading Oklahoma City Thunder - 1st in the Northwest Division. After receiving his award, Durant scored 32 points to mark an important victory over Houston Rockets, 117-105. Humble Durant joined previous winners such as Jason Kidd, Carmelo Anthony, Tim Duncan, etc. He will also be submitted for the U.S. Olympic Committee’s 2010 Sportsman of the Year Award, which will be announced in January. His phenomenal performance has also put him in the lead of all West Conference forwards for this year’s All-star game with 471,000 votes. KD recently reached his 250th game in the NBA with 6,360 points. Shaquille O’Neal (6,830) and LeBron James (6,638) were the only ones who managed to score more points in the same amount of games. Of what shall a man be proud, if he is not proud of his friends? -Robert Louis Stevenson. Everyone who had the chance to follow KD on facebook or even twitter can notice his humbleness - he never takes credit for victories. He's always praising his teammates and helping them to climb the ladder of success, be it for team Thunder or team USA . Since Durant can't thank enough everyone for the support, I think we should do our best to let him know how much we thank him. If you can't find a good reason, let me to give you one: when a Thunder game is on and KD is playing, we should thank him for a very simple thing, such as allowing people to check their problems at the door, sit down and have a good time. We can no other answer make, but thank you, thank you and thank you. We are proud of you KD! 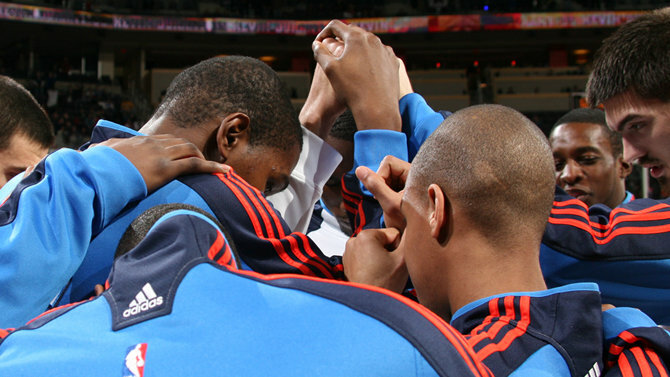 no.2 - the Thunder is a HELLUVA team! Last night's game was phenomenal. OKC won over Cavs with a result 106-77. The Thunder dominated all the time which led to the biggest victory of all season - so far. 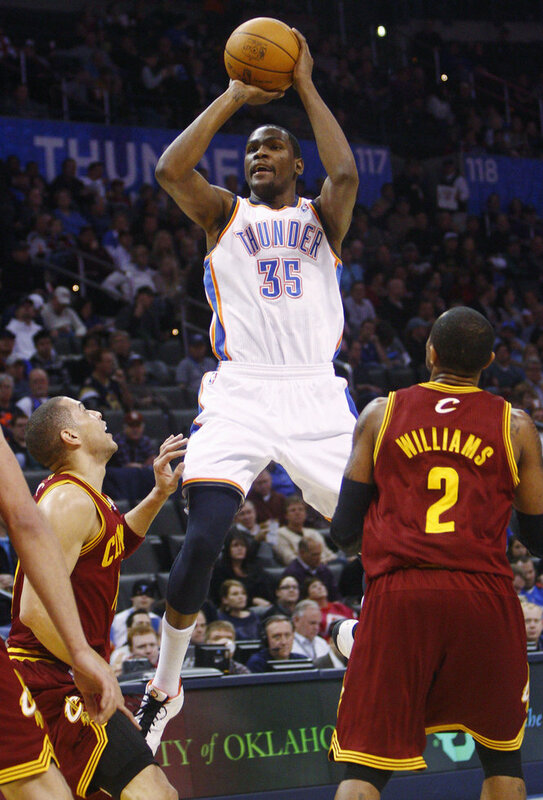 Kevin Durant played for 3 quarters and scored 25 points and seven rebounds. James Harden and Jeff Green added 19, while Westbrook scored 14 points and eleven assists. Except the wonderful team-play, the one that stood out from the rest of the guys was James Harden. He played for 20 minutes and scored 20 points. If you add the three magical assists and rebounds, you can definitely consider him a magician. Speaking of magicians, KD did an astonishing job at the last night's game. As the initiator of the victory, he made a 3-pointer to put the Thunder ahead in the first quarter. Look at your team, now back to mine. Now back to yours, now back to mine. Sadly, yours isn't mine. But if you stopped playing like that and watched how we play, your team could be like mine. Look down, now back up. Where are you? You're watching TV, watching me play the game that you could play. As mentioned above, this game was the biggest victory of the season for the Thunder. But the season is still young. 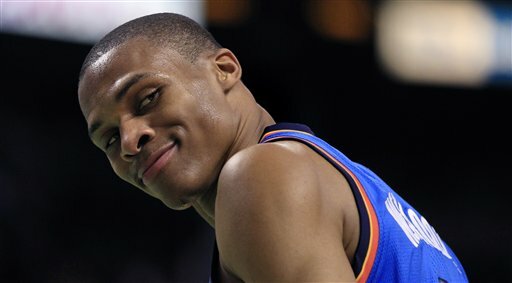 Who knows, maybe the Lakers will have a surprise from OKC. Thunder's next game is against Houston Rockets on Wednesday. We hope OKC will keep up the good work and never cease to amaze us. Out with the dark blues and in with the OKC colors! 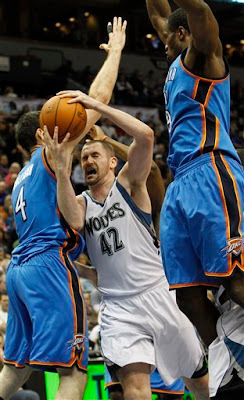 After a tough loss in Chicago, the Thunder got back by winning the game against Minnesota Timberwolves 111-103. The first quarter definitely wasn't an indicator that OKC would win - the Wolves kept a deficit by 19 points. OKC's game during the third and fourth quarter proved instrumental at this victory. The one that made the difference was Kevin Durant. He tied the score with a 3-pointer with only 34 seconds left. After that, humble Durant made his way back to the defense while clapping his hands with a GAME ON! attitude. Besides tying the score, KD kept doing his job in order to win. He scored 30 points, grabbed 11 rebounds and six assists. Russell Westbrook contributed 25 points and eight assists while Serge Ibaka had a career-high 8 blocks. OKC as a team had 42 rebounds. What helped the Thunder get back into the game, was strong defense and rebounding which was all thanks to our leader Kevin Durant. Along with Westbrook, KD is considered the first wheel of the "Thunder Mobile" - if they go right, the rest of the wheels will follow them. Until now, that's exactly what they've been doing. Durant and Westbrook are the "Now the party don't start 'til I walk in" leaders. And man, we need that party going more than ever! It's not because the Thunder lost. OK, maybe a little. But it's more because of the unbelievably high expectations in life. You know how it goes - when you make them, you feel energized, ready to conquer the world and when these expectations are too high, they slam you on the dirt. It's not because the Thunder lost. They did a solid job in the first and second quarter. During the third one, offense had difficulties at performing their best game. In the fourth quarter, OKC outscored the Bulls 24-17 but only for a short period of time. The Thunder fell to Chicago Bulls 90-99. Kevin Durant scored 29 points and five rebounds while Russell Westbrook added 19 points, seven assists and five rebounds also. Nenad Krstic scored career-high 18 points and six rebounds. James Harden contributed with 13 points off the bench to a total of 90 points that marked OKC's loss. Boozer scored 29 which were instrumental at finishing the game with 99 points for the Bulls. Being a little sad doesn't mean that it's because the Thunder lost. Sometimes it's because of the high expectations. When these expectations are too high, they slam you on the dirt. Then you try to get back up. You crawl but you fall again. Then it starts to rain. When it does, you feel hurt and sad but you fail to realize the most important thing. By the time all of this happened, you got back on your feet while the magical droplets of rain washed away the dirt from you. G.K. Chesterton said: And when it rains on your parade, look up rather than down. Without the rain, there would be no rainbow. Durant and Westbrook left aside their Competitor Attitude for a moment when they met USA teammate Stephen Curry. They exchanged their golden smiles which were won in Turkey, except Curry's smile turned into a frown. This happened due to OKC's victory against the Warriors with a result 114-109. The Thunder led by 23 points in the third quarter. The fourth quarter was led 90-70, until Monta Ellis (29 points) and Stephen Curry (39 points, six assists) tied down the result in 114-109. Durant's return brought freshness inside the team. 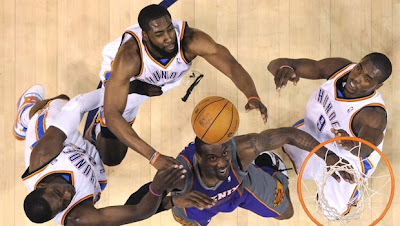 Besides scoring 28 points, seven rebounds and missing only one shot from the line, humble Durant helped his teammates to score double-digits. Russell Westbrook scored 19 points and 13 assists whose last night's appearance showed the absolute definition of "landing a hand". Serge Ibaka Scored 19 points and eight rebounds, Jeff Green 17 points and eight rebounds also, while James Harden scored 12 points. The Thunder as a team, made impressive 37 shots of 40 at the foul line. 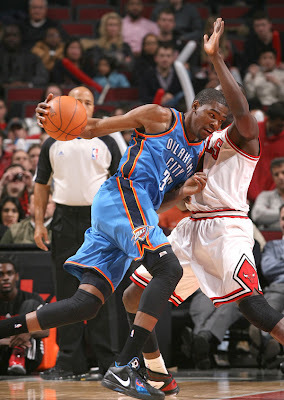 OKC's next game is against Chicago Bulls. Last time these two teams met, was at the season opening of the Thunder. Our team did a good job by winning 106-95. Since OKC won their previous game "thanks" to my raised Believe-O-Meter, imagine what they would do if every fan believed in their winning abilities. And by this, I don't mean I-love-OKC-when-they-win, and I-hate-OKC-when-they-lose kind of "fans". Kobe Bryant once said: My parents are my backbone. Still are. They're the only group that will support you if you score zero or you score 40. Now, we're not OKC players' parents, sisters or brothers but we surely are their second family. So lets show them that by giving maximum support no matter what. It snowed here in Kosova. I never liked snow more than today. Actually, I never liked snow. Maybe because I kept falling down and embarrassing myself, but today, I slowed down the pace. I stood glued to the window until the snow stopped falling. Then the magic disappeared along with the melted snow. This reminded me OKC's recent games. Their victories were beautiful to watch, just like the snowflakes. Until last night, when the magic disappeared somehow. OKC was defeated by Toronto Raptors with a result 99-111. The first half belonged to the Thunder (59-52). With Durant inactive for two games in a row, the winning responsibility was on Westbrook's shoulders. He did the best he could by scoring 20 points and seven assists. Westbrook couldn't reach his full potential due to Jose Calderon's great ability to keep him from scoring. Defense made the difference and won the previous games but not this one. This time, defense was weaker. With only 3 minutes left, they "let" Toronto lead 99-89. To the total sum of 99 points, James Harden did a good job by contributing 20 points, same as Westbrook, while Jeff Green scored 17 points and seven assists. But the one that stood out from the rest of the team was Thabo Sefolosha. Last night he set a career-high with six steals. 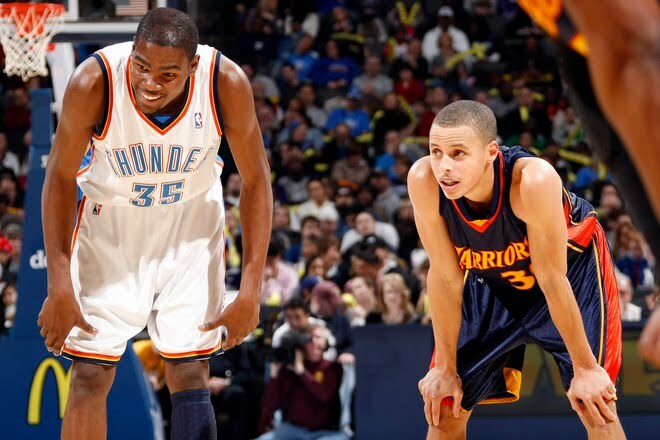 OKC's next game is against Golden State Warriors. I'm not good at predicting but since the holidays are near, my Believe-O-Meter has raised considerably. With that said, I hope and believe that OKC will win this one. And if they don't, it's alright. Because you know what they say - a good balance of winning and losing is important. You need a few losses to remind you how much winning means to you. It's OK to lose sometimes. What really matters is that you give your absolute best. And that's what I believe our guys always do. With or without Durant. With or without magic. Oklahoma City Thunder - New Jersey Nets 123-120. Triple overtime. Flawless Westbrook. Amazing Green. Solid defense. It seems perfect, doesn't it? Except the fact that Kevin Durant was inactive due to a sore left knee. But he was there. Wearing an elegant yet sportive suit, humble Durant was cheering for the team and giving maximum support. I am proud to say that the Thunder is currently 2nd in the Northwest Division. This ladder climb is all thanks to great games that the team is playing, such as last night's. Westbrook and Green were the key players of the game.They combined together 75 points for the Thunder. Since Jordan Farmar and Brook Lopez missed potential game winners in the first and second overtime, Westbrook took over by giving OKC another win. He did this by scoring 38 points, nine assists and 15 rebounds. A great "Westbrook Moment" during the game was when he dunked a missed jumper from Serge Ibaka. To me it seemed as if he was doing the "Red Bull gives you wiiiings" commercial. Nets played good since they pushed OKC in overtime with a 3-point buzz-beater shot. Even though they took a late-game lead in the fourth quarter, their game wasn't good enough to win. Jeff Green's wonderful appearance was crowned with a career high 37 points and three free throws, with only 4.6 seconds which sent the Thunder in the third overtime. By winning this game, the Thunder showed that endurance is patience concentrated. Last night, everything was like it should be. OKC won thanks to: triple overtime, flawless Westbrook, amazing Green and solid defense. It almost seems perfect, doesn't it? Except the fact that Kevin Durant was inactive due to a sore left knee.